Saddlebred Rescue (SBR) will be entering its 14th year dedicated to the mission of saving horses destined for slaughter and returning them to useful lives. It Takes All of Us Together! Each year presents a new challenge as Saddlebred Rescue Inc. (SBR) strives to continue its mission and remain on financially sound footing. Our volunteers dedicate their time and energy to work with the horses, provide the necessary care and training, and ultimately match them to those who are eager to provide them with a forever home. Adoption fees collected don't begin to cover the cost of maintaining our "treasures" until they are placed. Your donations have helped to feed them, and provided the means to pay the vet, the dentist and the farrier, not to mention the additional expenses for horses that have special needs. Our survival and the survival of these animals depend on your generous continued support to help SBR meet its goals. You have supported us to work with over 1,300 horses successfully over the years. 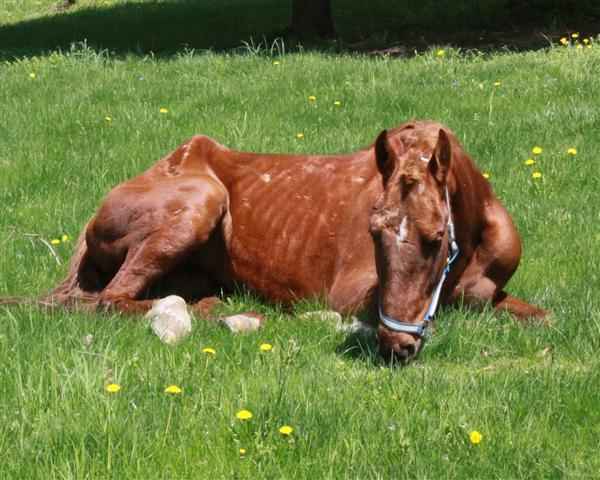 As we adopt out horses there are many more to save and provide them a second chance. They need your help. Donating to find out who Athena is! I am donating in support of this campaign. This donation is in memory of Marty Waldman, a great horseman who influenced many. This is for the Strawberry Roan that Shelia is fundraising for. I want to say, THANK YOU for all you guys have done. For her birthday, Elisa Himel, who adopted one of your horses, asked her friends to donate to Saddlebred Rescue instead of buying a birthday gift. Thank you for helping give all the new horses (and the old) what they need...even if it is not what we would hope for them. God bless you and you team for EVERYTHING you all do. We have a saddlebred who was forgotten and put to pasture, but has now transformed into a wonderful show horse and we want to help other horses.